As previously assumed, Taito's latest warming over of classic franchise—this time arcade game Qix—is officially this week's Xbox Live Arcade release of the week. Qix++ will be blocking off a space on Live Marketplace this Wednesday. 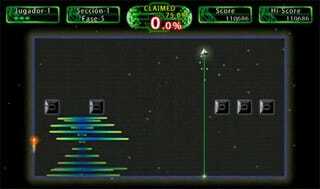 Expect wonderful Qix-style gameplay, but with a modern day, Geometry Wars-like re-skin, for a mere 800 Microsoft Points. We're still hunting down additional details on Qix++ from Taito and its owner Square Enix, but expect lots of levels, plenty of line-drawing and frantic arcade gameplay. Looks like Taito is also readying a PSP version of Qix++, should you prefer to wait for that. As a fan of the original and it's sequels, I'll be earmarking Points for Qix++. Will you?